It is doubtful that humanity, abandoned to its own fate can survive. 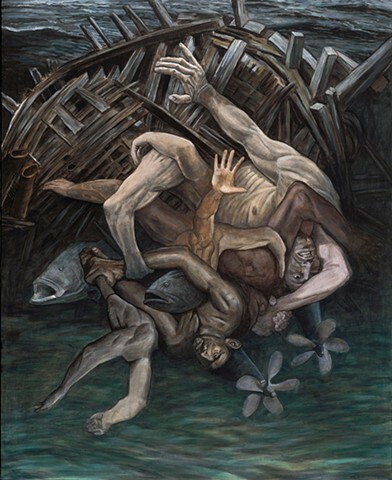 The painting Overboard starts at the point of plunging in, without hope of rescue – to sink or to swim. From air into water, these men cascade into the deep dark sea. Their boat, formerly a place of safety and life support, splinters apart sinking into the abyss. The men appear vulnerable and defective, grasping at each other; their arms spin like propellers as they tumble into their new environment. Are they fighting or clinging to each other? The water may overwhelm and drown them or buoy and sustain like amniotic fluid. Perhaps they can adapt, changing their DNA structures and severing unnecessary parts. The fish may be curious or possibly menacing. The propellers may be pushing them to safety or dragging them deeper. This is the crossroad without bearings and with an urgent panic about survival. Is this the moment of death or of rebirth?